Unexpectedly, the topic of melting glaciers also showed up in an analysis on cultural landscape changes which was conducted in the project HERCULES, aiming at increasing the “understanding of drivers, patterns and values of European cultural landscapes”. One of the study municipalities in the work package on short term landscape history of HERCULES is Lenk, located in the Swiss Alps. In Lenk, land cover change of the last 150 years has been analyzed based on historical maps, and additional sources were used to determine the drivers of the landscape change found. One of the methods used to assess past land cover and land cover change are oral history interviews (OHI). OHI are interviews conducted with long-term residents of the study municipality who know their landscape very well in past and present times. This source is helpful in different ways. First, local residents remember landscapes, landscape changes and actors/events of this changes which are not documented elsewhere. Second, data from OHIs reflect the human perspective on and perception of the landscape. The village Lenk is surrounded by high mountains and glaciers, which both are characteristic for this landscape. Most prominently, the Plaine Morte glacier is located in the southeast of the municipality. 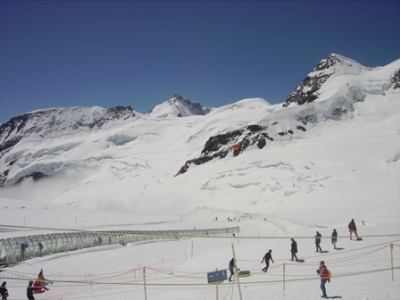 As other alpine glaciers, the glaciers of Lenk are shrinking. The map analysis shows the important reduction of glacier area (for the maps please click here). Melting of the glaciers is an ongoing process since the first analyzed map from 1840 and it even became the dominant land cover change in the time steps 1968-1992 and 1992-2013. These statements are in line with the results from the map analysis. Moreover, they show that the consequences of climate change contribute significantly to landscape changes as perceived by the local population. In Lenk, OHIs not only confirmed the results from the map analysis, but completed it further, with detailed qualitative information on the changes visible in the maps. One of the interviewees mentioned that the firn fields today melt much earlier in summer than when he was a child. Firn is not depicted in maps as it is not part of the continuous land cover, as glaciers are. Nevertheless firn is important for landscape perception and is from far away not visually distinguishable from glaciers. The combination of different data sources as presented in this article is a promising approach to analyze complex processes as landscape/land cover change. It is especially helpful to talk to long term residents of an area as they may have knowledge and views that will never appear in an archive. To our knowledge, our study on landscape changes in an alpine municipality is the first documented example on how climate change can leave major mapped and perceived traces in alpine landscapes.